Leader of the User Centred Product Design research group. Dan Högberg's research is about making user-centred information, e.g. ergonomics knowledge, relevant and easily available to product designers and engineers. These roles often need design methods and tools that facilitates the consideration of user aspects, along with other product/system requirements, in the complex time and budget constrained product realisation process. Central in Dan's research is digital human modelling (DHM) and how such technology can contribute in supporting designers and engineers to consider ergonomics/human factors proactively at virtual stages of the design process. Dan also conducts research in how sensors integrated into textiles can be used to evaluate ergonomics, including how the collected data can improve simulations in the virtual world. 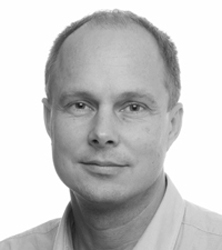 Dan is leader of the User Centred Product Design (UCPD) research group at University of Skövde. UCPD is one of several research groups within the research environment Virtual Engineering at the School of Engineering Science. The group's research is to a large extent carried out in close cooperation with industrial partners. UCPD has currently four focus areas: digital human modelling, anthropometry, industrial information design, and applications of smart textiles.